Collingwood’s Peter Daicos’ phenomenal ability to kick goals from seemingly impossible angles or when under the most extreme pressure was arguably unequalled in the history of the game. Certainly this ability became Daicos’ trademark, so much so that when players nowadays demonstrate a comparable knack they are almost invariably said to be ‘doing a Daicos’. A highly skilled footballer, Daicos, who was known as ‘The Macedonian Marvel’ because of his parents’ country of birth, was much more than just a goalsneak. He played much of his career on the ball or in the centre where his anticipation, balance and superlative ball handling ability made him a real force. Former Essendon rover John Birt paid Daicos a rare compliment by comparing his ball handling skill to that of Darrel Baldock and Alex Jesaulenko and it is doubtful if the sport has seen more than half a dozen or so comparably skilled individuals in its entire history. Peter Daicos’ bracketing with such illustrious names is entirely warranted, however. Recruited from Preston RSL, Daicos made his VFL debut as a centreman in round four, 1979 against St Kilda, racking up 28 possessions as the Magpies surged to a record 31.21 (207) to 3.11 (29) victory. Thereafter, apart from injury setbacks, which included a full knee reconstruction on one occasion, he never looked back. When he retired in 1993 he had played a total of precisely 250 league games and kicked 549 goals, besides winning Copeland Trophies in 1982 and 1988, and topping his club’s goal kicking list on four occasions. He was also a regular Victorian state of origin representative. 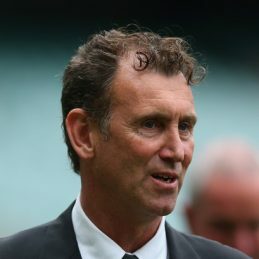 The highlight of Daicos’ career came in 1990 when he was a member of Collingwood’s first premiership team for 32 years. He was included in a forward pocket in the Magpies’ official ‘Team of the Twentieth Century’.